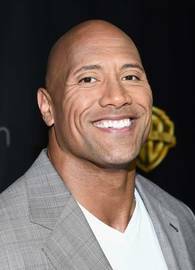 Dwayne Douglas Johnson, also known by his ring name "The Rock", is an actor, producer, and semi-retired professional wrestler, signed with WWE. Johnson was a college football player for the University of Miami, winning a national championship on the 1991 Miami Hurricanes football team. He later played for the Calgary Stampeders in the Canadian Football League, and was cut two months into the 1995 season. This led him to become a professional wrestler like his grandfather, Peter Maivia, and his father, Rocky Johnson (from whom he also inherited his Canadian citizenship).